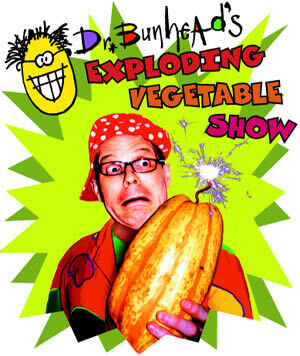 Most of Dr Bunhead's shows and seminars are for schools and universities. But there are a few public venues you can see him perform throughout the year. Have a look below to see if he's coming to a venue near you. In the begining was the word, and the word was BANG! 3pm Saturday 7th April 2012. 3pm Sunday 8th April 2012. 11.30am Monday 9th April 2012. TV's most extreme scientist (from Brainiac and stuff like that) investigates the science of bangs, burps and whooshy bits. Audience volunteers launch stuff and blow things up. We investigate "Is Barbie really indestructible?" and other important science questions. Come and find out. Umbrellas and extra strong underpants recommended!